Welcome to Camping! When I was a little girl my father and mother took us on camping trips a couple times a year. They were great times of exploring and learning how to hike, fish, and make a camp. During my youngest years I would take my dolls, and make shift sleeping bags and I would plan my dolls camping trip as well as mine. As I grew older I learned the process of camping and the joy it could bring if you came prepared, had a stocked supply of food and camping equipment. My mother taught me the fine art of creating a makeshift kitchen when camping. My father taught me how to fish, bait a hook, cast the line, and then clean them when done. My mother fried the cleaned fish, with potatoes and onions and we thought it was incredible. 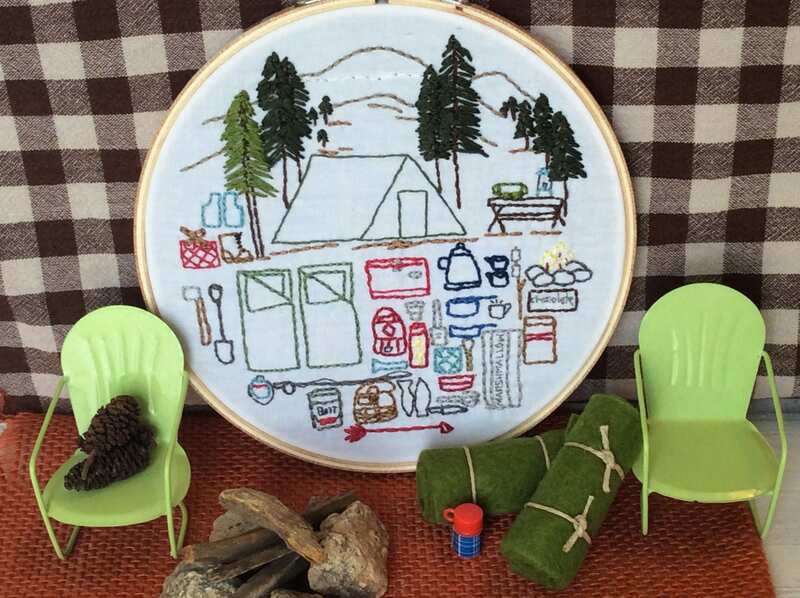 This camping embroidery pattern is a creation of the many things that were packed and unpacked at the camp site. 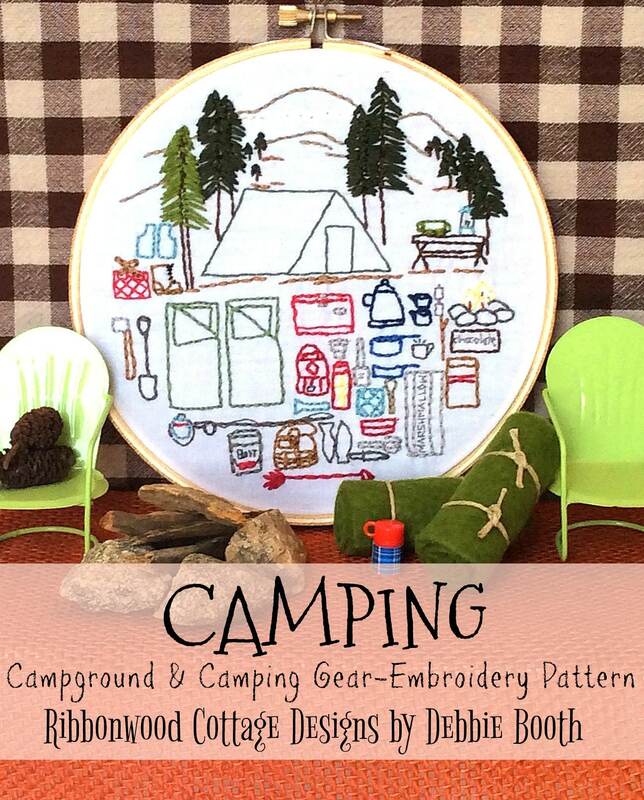 It is also a wonderful memory seeing the things we camped with in embroidery. 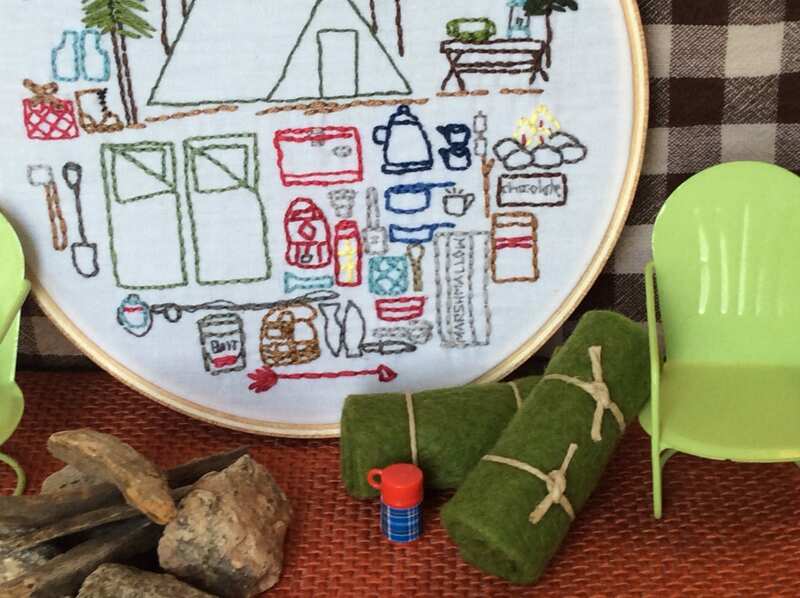 I love doing stitchery and handwork and it just seemed natural to put my love for camping in a project I could look at and enjoy. 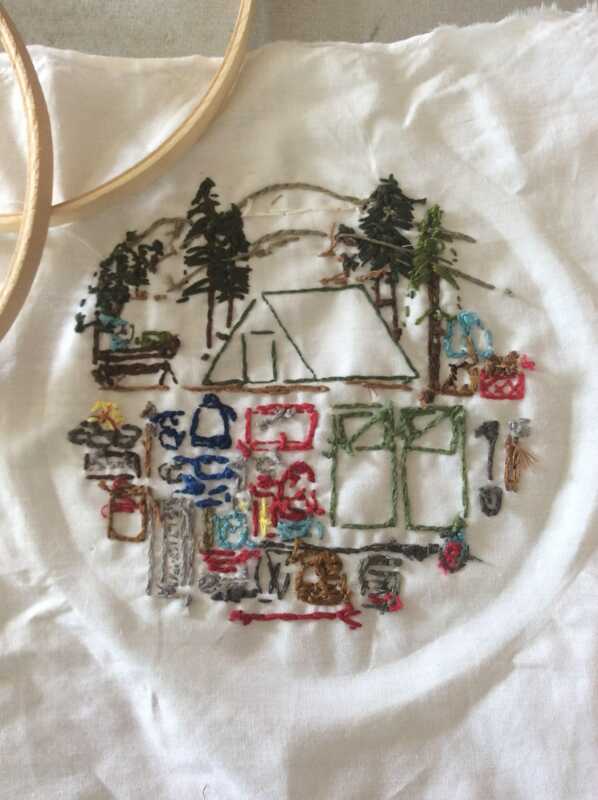 The finished design fits in a 6" embroidery hoop for display. 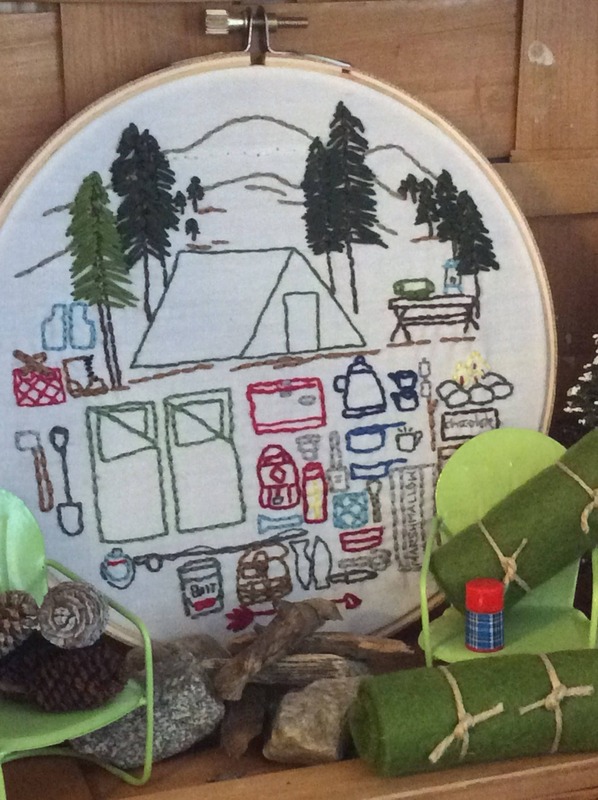 The colors used in this pattern are reminiscent of the vintage colors of sleeping bags, tents, and items that we used. The more contemporary colors in camping gear didn’t happen until I was an adult. The camp stove, sleeping bags, and tent as I remember were all an army green. Metal items like the collapsible cups that my father loved, were the color of galvanized metal. Other color choices can be used if desired. 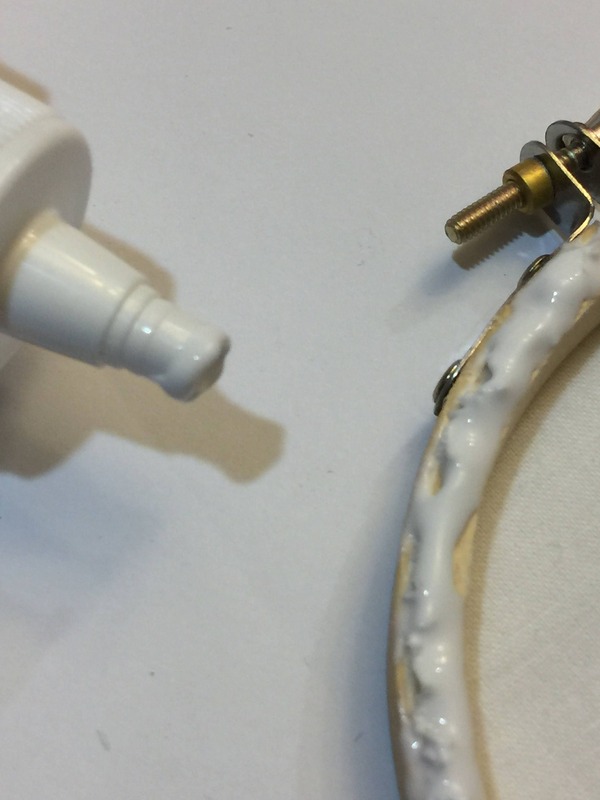 The thread color choices represent muted shades rather than bright colors. **We camped in the High Sierras, and at other campgrounds during my childhood. It seemed magical camping where you had to lean your head back to see the tops of the rocks, cliffs and waterfalls. You could close your eyes and smell the heavenly pine trees. Smoke would waft its way through the valley when campers would head back to their campsites to prepare dinner for their friends or family. I learned how to set up a camping kitchen, a fish cleaning station, a sleeping area, and a toy area. After all I was a little kid and my dolls went camping with me! My mother was adept at chasing the bears away by banging pots and pans together. We were thrilled at her bravery! I don't remember being afraid, just in awe at my otherwise calm and sedate mother who turned into a super hero while camping. Big smile. Both my parents loved the entire process and were so excited talking and planning the trips that we too were excited. Looking back I realize it was a great deal of work, but we all knew what to do, and my parents got us very involved with the process. I hope you enjoy this pattern as much as I did creating it. It brings back very happy memories. I can almost close my eyes and feel like I'm back at the campground with my parents laughing hysterically at my mom banging pots and pans together, and the bears running for their lives! This is a downloadable pattern that you will receive the link to as soon as the transaction is completed. No physical pattern will be sent in the mail.